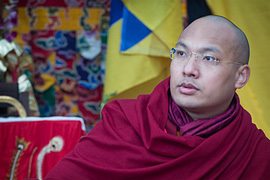 On September 29, 1992, His Holiness the Seventeenth Gyalwa Karmapa Ogyen Trinley Dorje performed his first public ceremony, bestowing the empowerment of Standing Red Chenrezig (Avalokiteshvara). 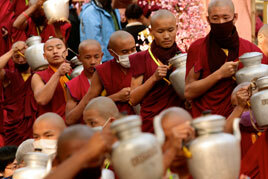 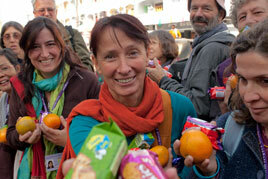 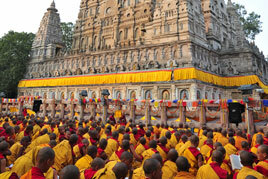 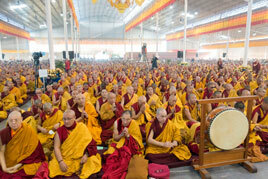 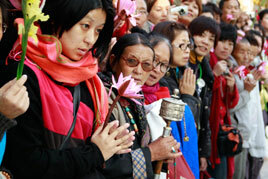 The empowerment was received by over 20,000 of his fortunate devotees. 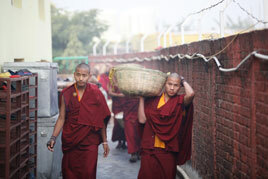 He was assisted by H.E. 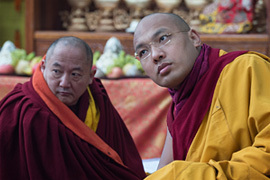 Tai Situ and H.E. 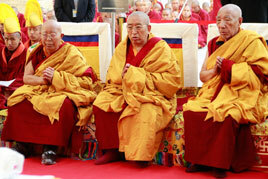 Gyaltsab Rinpoche, and read the core of the ceremony himself in a voice clear and steady. 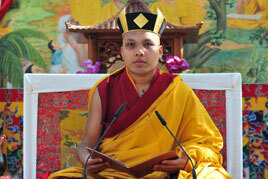 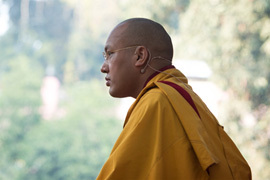 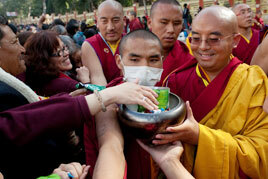 It was a moving moment for any who had known the previous Karmapa. 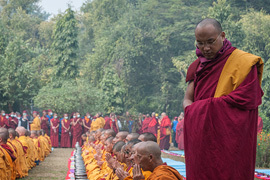 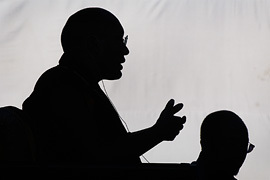 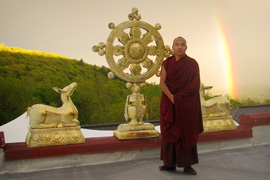 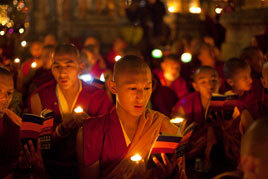 The Seventeenth Karmapa had begun his great compassionate activity, and it was acknowledged not only by the people present but also by a contingent of eagles which circled in a clockwise direction above the monastery, and by a horizontal rainbow that appeared in a virtually cloudless sky during the empowerment. 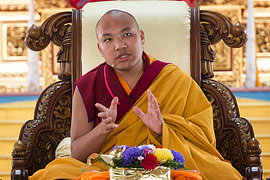 From the time of the First Karmapa (through this empowerment of Avalokiteshvara), the line of the Karmapas remains pure and unbroken. 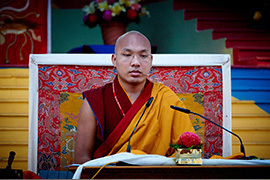 The lord of the dharma, the glorious First Karmapa, Dusum Khyenpa, was of the nature of all the Buddhas of the three times. 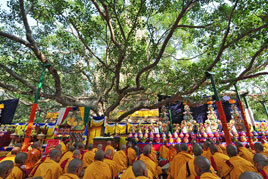 There have been countless bodily manifestations of him: bodhisattvas such Avalokiteshvara; accomplished masters such as Saraha; learned pundits such as Sri Vira (Ashvagosha) and Nagabodhi; kings, such as Indrabodhi; and in Tibet, Gyalwa Choyang, Putowa Rinchen Sel, Kharak Gomchung, and others. 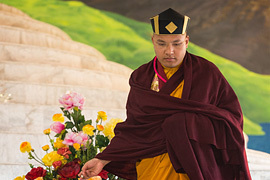 In the treasure predictions of Ratna Lingpa it is said: "Upholding the activity of Avalokiteshvara, the mantric yogi with awesome behavior, endowed with the name Human Saint Karmapa will transverse the whole land. 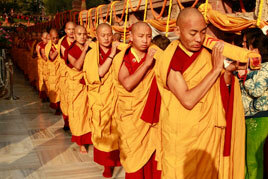 He will tame beings and protect them with skillful means and compassion." 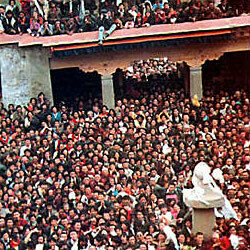 Thus he has been praised as being an emanation of Avalokiteshvara in the various treasure predictions of all the undisputed great revealers, the renowned representatives of Padmakara, who have appeared up through the fifteenth, sixty-year cycle such as Dorje Lingpa, Karma Lingpa, and others. 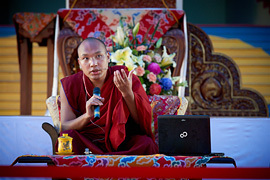 Ogyen Rinpoche, with his vajra speech, has said: "When seeing his face for but the fraction of an instant, the karmic obscurations of seven rebirths will surely be dispelled." 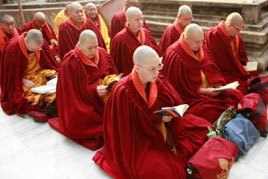 In these ways it has clearly been demonstrated in the prophecies that he is not different from the Noble Compassionate One.